Key Message: In peripheral nerve injuries, the treatment strategy is largely based on the nature and severity of injury. Whenever possible, a direct nerve repair is beneficial. Autografts play an important role in injuries with a gap >30 mm, while smaller nerve gaps may be managed with tubulisation techniques or allografts. Nerve transfers are emerging as preferred options for proximal injuries. They reduce the regeneration time, thereby improving the speed of end-organ re-innervation and outcome. Peripheral nerve injuries (PNI) are increasingly frequent and are known to occur in around 2.8% of the trauma population. The most common etiology of this devastating and debilitating condition continues to be trauma, with an annual incidence in the United States of approximately 350,000. With the recent desirable increment in the use of seat belts and crash helmets in most parts of the world, the occurrence of severe brain and spinal cord injuries are perhaps declining but PNIs are not. These injuries are overwhelmingly predominant in the young-to-middle aged male population, with the upper extremity being involved in 73.5% of the cases. The radial and the sciatic nerves are the most frequently involved nerves in the upper and lower extremity, respectively., Over the past few decades, considerable advances have been made in the realm of peripheral nerve surgery, which have improved the clinical outcome. The introduction of intra-operative electrophysiological assessment, microneurosurgery, nerve grafting techniques, with a revived interest in nerve transfers, has offered surgeons several innovative ways to circumvent a dismal outcome. This article attempts to recapitulate the current standards in the management of peripheral nerve injuries, with an emphasis on the use of nerve transfers to optimise outcome in nerve injury. It also examines their emerging role in spinal cord injury. Following diagnosis, the clinician should always strive to achieve a better understanding of the type of nerve injury, as this has a profound impact on subsequent management. Most injuries are mechanical in nature, which includes compression, traction, and transection. Other infrequent injury mechanisms include friction, pressure, ischemia, thermal injury, radiation and electrical injury. The etiopathology of nerve injury is largely dictated by a few factors. The anatomical location of the nerve is an important contributor to the injury type. For instance, the axillary nerve is particularly susceptible in shoulder dislocations secondary to traction, due to its precarious anatomy in this vicinity. It is interesting to note that owing to the lack of epineurium, perineurium and a decrease in the endoneurial collagen content, nerve roots are more prone to traction and compression injuries., Certain segments of the nerve are now known to be more susceptible to injury due to the changing fascicular composition along the course of the nerve. Seddon and Sunderland, in their seminal article, classified nerve injuries into five grades ranging from neuropraxia to neurotomesis, based on an increasing severity of injury., Practically, it is important to differentiate axonotmesis from neurotomesis as the latter almost always warrants surgical intervention. Higher grades of injury characteristically involve violation of nerve integrity, leading to aberrant reinnervation or suboptimal nerve regeneration due to Wallerian degeneration and subsequent end organ atrophy. The type of injury also heavily influences the recovery time which, in turn, is based on the regeneration rate, averaging 1 mm/day in humans. Despite numerous advances in peripheral nerve surgery, there is hardly any consensus regarding the timing of surgery as this is based on several factors such as the type and severity of injury, the degree of fascicular disruption, the required regeneration distance, the age and general condition of the patient, the risks associated with the procedure and the duration of symptoms. Most authors advocate immediate exploration when neurological deficits are elicited in the distribution of a nerve following a sharp penetrating injury, and in iatrogenic injury with presumed severance or open trauma. On the other hand, with closed trauma or suspected neuropraxia, a conservative management with serial clinical and electrophysiological assessment is recommended. However, the ideal period of observation is still unclear. The key factor that influences the timing of intervention is motor function recovery. Most authors agree that best results are achieved when surgery is performed within 3 to 6 months. High energy injuries causing severe neurological deficits are managed operatively following a shorter observation period of several weeks. The completeness of injury and regeneration distance are the main factors that should be determined during an evaluation of nerve injury. Reinnervation occurs via collateral sprouting in incomplete injuries, whereas it occurs with proximo-distal axon advancement in complete injuries. Fibrofatty degeneration of denervated muscle fibres is known to occur when the regeneration distance exceeds 20 inches. These factors significantly influence the timing of surgery. Generally, an early surgical consultation is recommended so that all options can be discussed with the patient. Every nerve repair essentially requires adequate external neurolysis to mobilise the nerve from points of compression or tethering due to scarring. Sufficient neurolysis along with a healthy vascularised bed helps to improve vascularity, thereby enhancing the results of nerve repair. It is important to expose both proximal and distal portions of the nerve, so an adequate segmental dissection is critical. Dissection is preferably performed towards the injury site from a normal segment of the nerve. Several types of nerve repairs are described to date. The type of injury, status of proximal nerve stumps, nerve gap, surgeon's expertise, and general condition of the patient are some of the factors known to influence the surgical approach. The following section briefly describes the various strategies for nerve repair. Direct repair is attempted when the severed ends can be approximated without tension. It is now known that excessive tension at the coaptation site is detrimental to nerve vascularity and functional outcome.,, Owing to the elastic nature of nerves, certain degree of tension is expected in most repairs. Nerve grafting is generally recommended when the tension at the coaptation site cannot be held by a single 8-0 suture. This technique is widely used by most authors for direct nerve repair. Several techniques have been described to achieve an end-to-end repair. This technique is mainly used when there is a sharp injury to monofascicular or diffusely grouped polyfascicular nerves without nerve loss. The goal is to achieve proper alignment of fascicles without excessive tension at the coaptation site [Figure 1]a. The longitudinal blood vessel markings on the epineurium provide a vital cue for aligning the fascicles. Two orienting 8-0 epineural sutures are placed 180 degrees apart as an anchor to avoid rotational displacement. The tail of the first suture is used to provide rotation for placement of the second suture. It is important to avoid injury to the perineurium. Finally, two additional sutures are placed 90 degrees away from the primary sutures to achieve a secure coaptation. Most authors prefer to restrict the number of sutures (≤4) to reduce the scarring process., The use of fibrin glue to augment repair is now a common practice to reduce the number of cross sutures [Figure 1]b. This technique is used for coaptation of mixed motor or sensory nerves where the fascicles serving different functions are clearly defined (examples include the ulnar nerve at the wrist, and the radial nerve proximal to the elbow before bifurcation into the posterior interosseous nerve and the superficial sensory radial nerve). Intuitively, this is a more accurate but technically challenging method of coaptation. To begin with, the damaged nerve ends should be resected, and the epineurium is reflected to clearly define fascicular anatomy. Sutures are placed through the interfascicular epineurium and perineurium for approximation using 8-0/9-0/10-0 nylon sutures. Since the interfascicular epineurium is not as tough as the epineurium, adequate mobilisation of the stumps is an important prerequisite to mitigate tension at the coaptation site. End-to-side repair or terminolateral neurorrhaphy involves coaptation of the distal stump of the transected nerve (recipient nerve) to the side of an intact nerve (donor nerve). Contrary to direct repair, there is no length limitation in this technique. The general principles of coaptation are similar to that involved in direct repair; however, it involves creation of an epineural window on the donor nerve matching the calibre of the acceptor nerve. The exact mechanism involved in functional recovery is not entirely clear. Some authors believe that nerve fibres invade the acceptor nerve from the donor nerve following injury at the coaptation site. Zhang et al., performed double labelling studies on end-to-side neurorrhaphies and found that collateral sprouting occurs from the undamaged donor nerves. Many authors have demonstrated outcomes ranging from poor to modest, but rarely excellent. Bertelli and Ghizoni reported poor outcomes using end-to-side repair for radial nerve, common peroneal nerve and C5, C6 root injuries. Viterbo and Ripari, however, were able to demonstrate good outcomes in a group of paraplegic patients in whom they tried to restore lower limb sensation to reduce pressure sores by anastomosing intercostal nerves to sciatic nerve in an end-to-side fashion using sural nerve graft. Mennen reported excellent outcomes with end-to-side hypoglosso-facial anastomosis for facial reanimation using an interpositional jump graft. Nerve grafting is preferred when direct repair is likely to result in an undesirable tension at the coaptation site due to the presence of long gaps between the proximal and distal stumps. This is achieved using autografts, allografts or conduits depending on the amount of nerve gap. Tubulization techniques (conduits) may be used for gaps less than 3 cm; however, larger gaps would be a clear indication to use grafts. Sometimes, nerve grafting is used for split repair when there is only partial injury to the nerves, thereby sparing some of the fascicles [Figure 2]. In such scenarios, intra-operative nerve action potentials are helpful in identifying the injured fascicles which fail to conduct a response. These injured fascicles are thereby sectioned, and the resulting gap is then reconstructed using the interfascicular graft technique. Whenever possible, in any PNI involving a large gap, autografts are used. The choice of the graft is largely based on the site of injury, the nerve involved and the surgeon's preference. The commonly used donor nerve grafts are sural nerve, medial antebrachial cutaneous nerve below elbow, lateral antebrachial nerve proximal to the elbow, dorsal cutaneous branch of ulnar nerve and lateral femoral cutaneous nerve. Whenever possible, the surgeons should try to obtain the graft from near the vicinity of the injury, so that an additional incision can be avoided. However, this is not always possible in clinical practice as adequate graft length may not be available. This eventually leads to exploration of a different region, thus increasing the operative time, chances of wound complications and donor site morbidity. There are numerous technical principles that heavily influence the success of nerve grafting. It is important to inspect the proximal and distal nerve stumps for an excellent anatomical organisation once the intervening neuroma has been fully resected. The fascicles should also be meticulously inspected after reflection of the epineurium, to remove all fibrotic tissue amidst them. After adequate mobilisation of both the stumps, the nerve gap is determined. Generally, the surgeon should try to obtain a graft which is 10 to 20% longer than the gap, thus mitigating tension at the coaptation site. It is always imperative to keep the graft moist to avoid its shrinkage. Smaller diameter grafts are preferred to larger grafts, as the latter have compromised vascularity in their core, which is detrimental to the outcome. Several graft segments are required in the interfascicular graft technique to cover the full extent of the proximal and distal stumps. To prevent fascicular malalignment, the interfascicular tissue is dissected and the fascicles are arranged in groups akin to fingers. Cross sutures are taken through the epineurium in the host stump and the interfascicular epineurium and perineurium in the isolated fascicles, spreading the cross-section of the graft in a fish-mouth pattern. It is important to place the repair on a healthy vascularised bed to aid the healing process and to mitigate scarring. Longer grafts are generally associated with a suboptimal outcome. However, this is not directly related to the longer regeneration distance. A poorer outcome is because a greater nerve tissue loss is generally associated with extensive and more proximal injuries, which in turn, is associated with greater loss of neurons in the dorsal ganglia/spinal cord. Hence, longer grafts are used in the setting of severe injuries which generally portends a dismal outcome. Cadaveric donor nerve grafts are used in PNIs which result in a large nerve gap where autografts would not suffice. They provide viable Schwann cells for regenerating axons. However, their immunogenicity is the main issue that precludes their use in clinical practice. Even though they are not as immunogenic as skin or muscle, the use of nerve allografts almost always requires associated immunosuppressive therapies, without which graft rejection occurs. Midha et al., reported that the immunogenicity wanes over time as the process of Schwann cell exchange from the donor to the host proceeds. Major histocompatibility matching, immunosuppressive drugs, and allografts preparation are some of the techniques used by various centres in the world to reduce antigenicity. Nerve transfer is a surgical strategy which entails an intentional sacrifice of a physiologically active nerve with low donor morbidity and transferring it to a more important distal, irreparable paralyzed nerve. Nerve transfer techniques are broadly classified into 2 categories: proximal nerve transfer and distal nerve transfer. While proximal nerve transfer involves exploration, identification of proximal and distal nerve stumps, positioning of nerve grafts or nerve transfers for reconstruction, distal nerve transfer is a newer strategy that involves performing coaptation closer to the end organ. Over the past three decades, there has been a shift towards distal nerve transfers with increasingly better results. Today, there are several nerve transfer options for restoration of elbow flexion, as well as shoulder, forearm and hand function. Most of them have succeeded in demonstrating positive, reproducible outcomes. The following section discusses motor nerve transfers to enhance function in specific muscles in the upper extremity. The upper trunk is most commonly involved in brachial plexus injury, leading to loss of shoulder external rotation and abduction, shoulder flexion and extension, and elbow flexion. In clinical practice, restoration of elbow function usually receives topmost priority. It is important to perform a detailed clinical examination to accurately ascertain the ideal donor. Intercostal nerves, spinal accessory nerve, medial pectoral nerve, fascicles from median and ulnar nerve are some of the donors which are routinely used., Alternatively, an Oberlin transfer which involves a simple transfer of an ulnar nerve fascicle to the biceps branch of musculocutaneous nerve may be used. In the author's opinion, if hand function is preserved, a single or double fascicular transfer from the redundant nerve fascicles from median and ulnar nerve to the biceps and brachialis branches of musculocutaneous nerve is most ideal. Mackinnon et al., reported their results of double fascicular transfer on 6 patients, in whom a mean recovery elbow flexion power of grade 4/5 was achieved without noticeable decrement in pinch and grip strength. Subsequently, Ray et al., reiterated these findings in a retrospective series involving 29 patients. The use of double fascicular transfer while being theoretically better, has not been validated to provide better motor outcomes. To date, most studies on double neurotization for elbow flexion are uncontrolled, underpowered and retrospective by design. In a systematic review, Garg et al., compared single and double fascicular transfer for elbow flexion. They found a trend towards improved outcomes with double neurotization, but this was statistically insignificant. Carlsen et al., also compared 55 patients with single or double neurotization and found no statistically significant difference in elbow flexion or supination between the 2 groups. In a prospective study involving 40 patients, Martins et al., compared single and double neurotization for elbow flexion. Randomization along with the use of push and pull dynometer recordings standardized to the uninjured side to negate potential interpretation bias (as against the Medical Research Council [MRC] grading) were the hallmarks of this study. They concluded that both techniques were equally efficacious with a similar safety profile. The potential benefits of a triple transfer including the nerve to brachioradialis for elbow flexion is yet to be explored. Restoration of shoulder abduction and external rotation is secondary to elbow flexion in the hierarchy of restoration of function. This is achieved by reinnervation of suprascapular and axillary nerves. However, this is dependent on availability of donors. Studies have demonstrated that shoulder stability and dynamic function is best achieved when both nerves are reinnervated. Some of the donors that have been used in clinical practice are intercostal nerves, thoracodorsal nerve, medial pectoral nerve, long thoracic nerve, phrenic nerve, ipsilateral and contralateral C7 root and hypoglossal nerve. However, most authors prefer spinal accessory to suprascapular nerve along with triceps branch/medial pectoral nerve to axillary nerve transfers to restore shoulder function. The spinal accessory to suprascapular nerve transfer can be performed via an anterior or posterior approach. The posterior approach is preferred by some since it provides a coaptation distal to the suprascapular notch closer to the muscle, thus reducing the denervation time. The triceps branch to axillary nerve transfer helps to restore deltoid and teres minor function. The medial branch of triceps is often used since it provides an adequate length and permits a tensionless coaptation. It is important to include the teres minor branch of axillary nerve to allow an additional shoulder external rotation. Bertelli and Ghizoni reported the return of MRC grade 3 or better strength in shoulder abduction in 70% of a series of 10 patients. Leechavengvongs et al., also reported return of grade 4 strength in deltoid in a series of 7 patients. Some authors have used the medial pectoral nerve when triceps branch is not available with reasonable success. Samardzic et al., reported 83.3% recovery of shoulder abduction and 58.3% recovery of shoulder external rotation. Ray et al., published their series of eight patients, in whom, 75% of patients achieved a good to excellent outcome. Radial nerve is one of the most commonly injured nerves in the upper extremity. Proximal injuries result in lack of wrist and digit extension with diminished grip strength and hand function. Kim and colleagues reported excellent outcomes with direct and graft repair in 260 patients with radial nerve injuries. They observed grade 3 or better power in 91 percent of patients. However, patients with injuries occurring proximal to the humerus, usually fare poorly due to the long regeneration distance of the nerve. Bertelli and Ghizoni could achieve a good outcome in only 5 of 13 such patients and hence strongly recommended a combination of nerve grafts with nerve/tendon transfer. In this setting, most authors recommend a dual nerve transfer from the median nerve to the radial nerve.,, Wrist extension is achieved by coaptation of flexor digitorum superficialis nerve to the extensor carpi radialis brevis. The flexor carpi radialis nerve is transferred to the posterior interosseous nerve to achieve finger extension. These synergistic transfers simplify post-operative re-education of muscle groups in the affected patients. Ray and Mackinnon, in a study of 19 patients, reported the return of MRC grade 4 strength of wrist extension in 18 of their patients, while 14 patients achieved grade 3 or more strength in finger and thumb extension. A few other transfers have also been described for radial nerve injuries. Bertelli et al., demonstrated the efficacy of transfers from the pronator quadratus branch to the extensor carpi radialis brevis (ECRB), to restore wrist extension, in a study of 4 patients. Bertelli and Ghizoni reported the supinator motor branch to the posterior interosseous nerve (PIN) transfer on 4 patients with C7-T1 brachial plexus injury. All patients in this series achieved grade 3 metacarpophalangeal joint extension and thumb extension. Dong et al., also reported success with this latter transfer in a series of 3 patients. Some authors complement these dual nerve transfers with tendon transfers, and surgeons should keep in mind not to compromise the use of tendon transfers by performing nerve transfers that may negate the availability of muscles and tendons to transfer. Hence, a very individualised approach to patients is mandatory where both nerve and tendon transfers, along with pros and cons of each, are considered. Depending on the site of involvement, median nerve injury results in loss of forearm pronation, finger flexion and thumb opposition. Reconstruction options are dependent on the location and severity of the nerve injury. Traditionally, tendon transfers were used for high median nerve injuries, when proximal nerve repairs failed to deliver a good outcome in the motor aspects of the nerve. More recently, nerve transfers have been described using branches of the radial nerve, the brachialis branch of the musculocutaneous nerve, and branches of the ulnar nerve. Pronation is one of the functions of the median nerve which plays an important role in activities of daily living. Hence, many authors have worked towards restoration of this function. 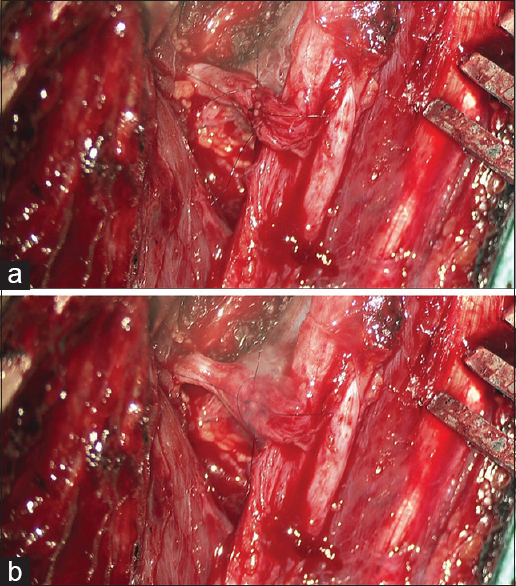 Boutros et al., described the transfer of flexor carpi ulnaris nerve to pronator teres nerve. Tung and Mackinnon demonstrated transferring flexor digitorum superficialis nerve to the pronator teres nerve. Few other authors have used the expendable branches of the radial nerve for this purpose. Since most activities require the simultaneous use of wrist extension and pronation, transfer of nerve to ECRB to the pronator teres nerve is a well preferred option. These synergistic movements will facilitate motor re-education post-operatively. Nerve transfers to anterior interosseous nerve (AIN) have been described to restore finger and thumb flexion. Some of the donors routinely used in clinical practice are expendable branches of musculocutaneous, radial and ulnar nerve. Following anatomical studies, Zheng et al., performed and reported a good outcome in 5 out of 6 patients by transferring the musculocutaneous branch to brachialis to the posterior fascicular group of the median nerve (AIN and palmar longus fascicles). Hsiao et al., reported return of MRC grade 4 strength in a patient with iatrogenic median nerve injury, by transferring supinator branch of radial nerve to the AIN. Garcia-Lopez also reported a good outcome by transferring brachioradialis branch of radial nerve to the AIN. Depending on the site of injury, ulnar nerve injuries result in loss of grip strength, pinching strength and hand dexterity. With proximal nerve injuries, return of hand function is extremely unlikely even with immediate repair, due to the long regeneration distance. This illustrates the potential superiority of nerve transfer which is directed towards distal reinnervation of the small muscles of the hand. With an intact median nerve, the terminal branch of the AIN (nerve to pronator quadratus muscle) is transferred to the deep branch of the ulnar nerve [Figure 3]. It may be noted that this is not a synergistic transfer, but improvement in pinch and grip strength with decreased clawing has been reported by a few authors., This is usually performed in an end to end fashion. In a patient with both median and ulnar nerve injury, Tung et al., reported return of MRC grade 4 strength in the first dorsal interosseous muscle by transferring terminal branches of PIN to the motor branch of ulnar nerve. Recent experimental studies have demonstrated the efficacy of reverse end to side or supercharge nerve transfer., Barbour and colleagues described the AIN to ulnar nerve supercharge end to side transfer (SETS) procedure to enhance recovery of intrinsic function of the hand without sacrificing the native ulnar nerve. This technique helps to prevent denervation atrophy of the target muscle by decreasing the regeneration time. In a retrospective study involving 55 patients, Davidge and colleagues studied supercharge AIN to ulnar nerve transfer to restore intrinsic functions of the hand. In their paper, 49 percent of patients demonstrated a gradual recovery of intrinsic functions of hand between 3 and 12 months of the post-operative period, consistent with axonal regeneration. Axonal regeneration from SETS would ideally happen in a time period between 4 to 7 months. However, the study population showed greatest improvement in pinch strength and first dorsal interosseous muscle strength in 1 to 3 months and 3 to 6 months respectively, thus providing weak evidence that SETS transfer contributed primarily to motor recovery. Sciatic nerve injuries are frequently encountered in clinical practice and they result in significant functional impairment owing to foot weakness, loss of foot sensation and altered gait. Results of nerve repair (even immediate) have been extremely disappointing due to the long distance for regeneration and poor muscle reinnervation and outcomes especially for the peroneal nerve division. In such devastating injuries, reconstructive options for the sciatic nerve are mainly focussed on achieving tibial nerve function to restore foot sensation and plantar flexion for push off in the stance to swing the phase of walking. Other transfers include femoral and obturator nerves for thigh or hip function, and tibial nerve branches to peroneal nerve transfers for foot drop. To date, quality evidence supporting the efficacy of nerve transfers in restoring lower extremity function is exceedingly scarce. In patients with sciatic nerve injuries with no motor recovery within 4 to 6 months, femoral to tibial nerve transfers can restore propulsion strength by coaptation closer to the target end organ. The terminal branches of femoral nerve have been used to innervate the gastrocnemius muscles without the need of an interpositional cable graft. However, post-operative motor re-education involved learning to coordinate quadriceps activation to that of gastrocnemius. In an anatomical feasibility study, Moore et al., reported satisfactory results with transfer of the terminal branches of femoral nerve (vastus medialis and vastus lateralis) to the tibial branch to gastrocnemius. With adequate neurolysis of the recipient nerve, they could avoid using a graft for coaptation of the branch to vastus medialis to the tibial nerve. However, this was not possible for vastus lateralis. With dedicated motor and sensory re-education, the patient demonstrated an improved calf muscle bulk and function, achieving up to MRC grade 3 strength at a 2-year follow up period. The patient also showed marked improvement in the capacity to ambulate. Spinal cord injuries (SCI) are extremely devastating with the annual health care cost estimated to be $9.7 billion. Restoration of hand function paves the path to independence and improved quality of life. It is now widely accepted that nerve transfers improve functional outcome in PNI. Few authors have tried to extrapolate and reproduce these results in SCI by transferring expendable nerves from a myotome where the patient has volitional control (usually supralesional to the SCI) to a recipient nerve in a myotome without volitional control. Spasticity and joint contractures make an accurate neurological assessment very challenging. Pre-operative electrodiagnostic studies will be immensely helpful in characterising and delineating the injury. Autonomic dysfunction, chronic wounds, and recurrent infections predispose these patients to perioperative complications, so patient selection and informed consent are key issues to deal with. It is extremely important to identify the correct donor nerve to avoid new unacceptable weakness/decrement in function. In addition, the surgeon must also strive to foresee the consequences of the current procedure to future surgeries. All the nerve transfers mentioned in the previous section could be used depending on the level of injury [Figure 4]. For instance, for a C6 ASIA-A injury, the musculocutaneous nerve branch to brachialis may be transferred to the anterior interosseous nerve/flexor carpi radialis/flexor digitorum superficialis to re-establish volitional hand control. However, it may be noted that the biceps will not be available for tendon transfer following this procedure. Though biceps can provide functional elbow flexion, the functional impact of losing brachialis function in the tetraplegic population is also not entirely clear. Fox et al., in a series of 7 patients with SCI, described multiple nerve transfers for mid to lower cervical cord injuries. They reported functional gains as early as 6 months post-surgery, and significant functional gains were achieved by 8 to 12 months. Bertelli and Ghizoni also reported satisfactory restoration of finger flexion in 50%, patients, in a series of 9 patients with cervical cord injury. They also opined that the nerve to extensor carpi radialis brevis (ECRB) was a better donor for finger flexion than nerve to brachialis or brachioradialis. Loch-Wilkinson and colleagues reported 2 patients with Brown-Sequard syndrome, in whom multiple nerve transfers were performed akin to those done in brachial plexus injury. In the first patient, the author performed spinal accessory to suprascapular nerve, radial to axillary and Oberlin's transfer. Despite using motor nerves as donors from somewhat spastic muscles, they noted the return of MRC grade 4 power for shoulder abduction, elbow flexion, internal and external rotation. Though the follow-up was limited for the second patient, there was electrophysiological evidence of reinnervation in the 8-month post-operative period. Due to an improved understanding of the pathophysiology of PNI, the past few decades have witnessed tremendous progress in the surgical management of nerve injuries. The selection of treatment strategy is largely based on the nature and severity of injury. Whenever possible, one must strive for a direct nerve repair. Autografts play an important role in injuries with a gap > 30mm, for which decellularized allografts remain unproven, while smaller nerve gaps may be managed with tubulisation techniques or allografts. Nerve transfers are emerging as preferred options for proximal injuries and are becoming increasingly desirable owing to their capacity to reduce the regeneration time, thereby improving the speed of end-organ re-innervation and outcomes. The utility of these innovative transfers may be exploited in SCI to achieve various goals depending on the patient's need. Indeed, restoration of hand function in this unfortunate subset of patients can significantly improve their quality of life. Noble J MC, Prasad VS, Midha R. Analysis of upper and lower extremity peripheral nerve injuries in a population of patients with multiple injuries. J Trauma 1998;45:116-22. Fowler JR LM, Huard J, Goitz RJ. Biologic strategies to improve nerve regeneration after peripheral nerve repair. J Reconstr Microsurg. 2015:31:243-8. Kouyoumdjian JA. Peripheral nerve injuries: A retrospective survey of 456 cases. Muscle Nerve 2006;34:785-8. Robinson LR. Traumatic injury to peripheral nerves. Muscle and Nerve 2000;23:863-73. Ferrante MA. The electrodiagnostic examination with peripheral nerve injuries. In: Mackinnon SE NC, Myckatyn TM, Tung TH.(Editors). Nerve surgery. New York: Thieme; 2015p59-74. Sunderland S. The anatomy and physiology of nerve injury. Muscle Nerve 1990;13:771-84. HJ S. A Classification of Nerve Injuries. BMJ 1942;2:237-9. Spinner RJ, Kline DG. Surgery for peripheral nerve and brachial plexus injuries or other nerve lesions. Muscle Nerve 2000;23:680-95. Shen J, Cartwright MS. Neuromuscular ultrasound in the assessment of polyneuropathies and motor neuron disease. J Clin Neurophysiol 2016;3:86-93. Lehmann HC, Zhang J, Mori S, Sheikh KA. Diffusion tensor imaging to assess axonal regeneration in peripheral nerves. Exp Neurol 2010;223:238-44. Eguchi Y, Ohtori S, Yamashita M, Yamauchi K, Suzuki M, Orita S, et al. Clinical applications of diffusion magnetic resonance imaging of the lumbar foraminal nerve root entrapment. Eur Spine J 2010;19:1874-82. Ditty BJ ON, Rozelle CJ. Surgery for peripheral nerve trauma. In: Tubbs RS RE, Shoja MM, Loukas M, Barbaro N, Spinner RJ (editors). Nerves And Nerve Injuries. Amsterdam: Elsevier; 2015. p. 373-81. Goubier JN Teboul F. Grading of nerve injuries. In: Tubbs RS RE, Shoja MM, Loukas M, Barbaro N, Spinner RJ (editors). Nerves and nerve injuries. Amsterdam: Elsevier 2015.p603-10. Dvali L McKinnon S. Nerve repair, grafting, and nerve transfers. Clin Plast Surg 2003;30:203-21. Maggi SP LJ, Mackinnon SE. Pathophysiology of nerve injury. Clin Plast Surg 2003;30:109-26. Tetik C, Ozer K, Ayhan S, Siemionow K, Browne E, Siemionow M. Conventional versus epineural sleeve neurorrhaphy technique: functional and histomorphometric analysis. Ann Plast Surg 2002;49:397-403. Matsuyama T, Mackay M, Midha R. Peripheral nerve repair and grafting techniques: A review. Neurol Med Chir (Tokyo) 2000;40:187-99. Ogata K, Naito M. Blood flow of peripheral nerve effects of dissection, stretching and compression. J Hand Surg Br 1986;11:10-4. Lundborg G, Rosén B, Dahlin L, Danielsen N, Holmberg J. Tubular versus conventional repair of median and ulnar nerves in the human forearm: Early results from a prospective, randomized, clinical study. J Hand Surg Am 1997;22:99-106. Bratton BR, Kline DG, Coleman W, Hudson AR. Experimental interfascicular nerve grafting. J Neurosurg 1979;51:323-32. Rovak JM CP, Kuzon Jr WM. Terminolateral neurorrhaphy: A review of the literature. J Recon Micr 2001;17:615-24. Zhang Z SP, Bo J, Beris AE. Evaluation of collateral sprouting after end-to-side nerve coaptation using a fluorescent double-labeling technique. Microsurgery 1999;19:281-6. Bertelli JA GM. Nerve repair by end-to-side coaptation or fascicular transfer: A clinical study. J Recon Micr 2003;19:313-8. Viterbo F, Ripari WT. Nerve grafts prevent paraplegic pressure ulcers. J Reconstr Microsurg 2008;24:251-3. Mennen U. End-to-side nerve suture--a technique to repair peripheral nerve injury. S Afr Med J 1999;89:1188-94. 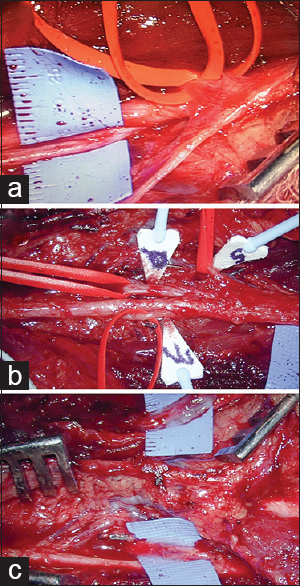 Best TJ, Mackinnon SE, Evans PJ, Hunter D, Midha R. Peripheral nerve revascularization: Histomorphometric study of small- and large-caliber grafts. J Reconstr Microsurg 1999;15:183-90. Midha R, Mackinnon SE, Becker LE. The fate of Schwann cells in peripheral nerve allografts. J Neuropathol Exp Neurol 1994;53:316-22. Karabekmez FE, Duymaz A, Moran SL. Early clinical outcomes with the use of decellularized nerve allograft for repair of sensory defects within the hand. Hand (NY) 2009;4:245-9. Guo Y, Chen G, Tian G, Tapia C. Sensory recovery following decellularized nerve allograft transplantation for digital nerve repair. J Plast Surg Hand Surg 2013;47:451-3. Tung TH, Mackinnon SE. Nerve transfers: Indications, techniques, and outcomes. J Hand Surg Am 2010;35:332-41. Brown JM, Mackinnon SE. Nerve transfers in the forearm and hand. Hand Clin 2008;24:319-40. Boyd KU, Nimigan AS, Mackinnon SE. Nerve reconstruction in the hand and upper extremity. Clin Plast Surg 2011;38:643-60. Lee SK, Wolfe SW. Nerve transfers for the upper extremity: New horizons in nerve reconstruction. J Am Acad Orthop Surg 2012;20:506-17. Tung TH, Novak CB, Mackinnon SE. Nerve transfers to the biceps and brachialis branches to improve elbow flexion strength after brachial plexus injuries. J Neurosurg 2003;98:313-8. Ray WZ, Mackinnon S. Clinical outcomes following median to radial nerve transfers. J Hand Surg Am. 2011;36:201-8. Carlsen BT, Kircher MF, Spinner RJ, Bishop AT, Shin AY. Comparison of single versus double nerve transfers for elbow flexion after brachial plexus injury. Plast Reconstr Surg 2011;127:269-76. Martins RS, Siqueira MG, Heise CO, Foroni L, Teixeira MJ. A prospective study comparing single and double fascicular transfer to restore elbow flexion after brachial plexus injury. Neurosurgery 2013;72:709-14. Moore AM, Novak CB. Advances in nerve transfer surgery. J Hand Ther 2014;27:96-105. Bhandari PS, Deb P. Posterior approach for both spinal accessory nerve to suprascapular nerve and triceps branch to axillary nerve for upper plexus injuries. J Hand Surg Am 2013;38:168-72. Bertelli JA, Ghizoni MF. Reconstruction of C5 and C6 brachial plexus avulsion injury by multiple nerve transfers: Spinal accessory to suprascapular, ulnar fascicles to biceps branch, and triceps long or lateral head branch to axillary nerve. J Hand Surg Am 2004;29:131-9. Samardzic M, Rasulic LG, Grujicic DM, Bacetic DT, Milicic BR. Nerve transfers using collateral branches of the brachial plexus as donors in patients with upper palsy--thirty years' experience. Acta Neurochir (Wien) 2011;153:2009-19. Ray WZ, Murphy RK, Santosa K, Johnson PJ, Mackinnon SE. Medial pectoral nerve to axillary nerve neurotization following traumatic brachial plexus injuries: Indications and clinical outcomes. Hand (N Y) 2012;7:59-65. Kim DH, Kam AC, Chandika P, Tiel RL, Kline DG. Surgical management and outcome in patients with radial nerve lesions. J Neurosurg 2001;95:573-83. Bertelli JA, Ghizoni MF. Results of nerve grafting in radial nerve injuries occurring proximal to the humerus, including those within the posterior cord. J Neurosurg 2016;2016:179-185. Lowe JB 3rd, Sen SK, Mackinnon SE. Current approach to radial nerve paralysis. Plast Reconstr Surg 2002;110:1099-113. Bertelli JA, Tacca CP, Winkelmann Duarte EC, Ghizoni MF, Duarte H. Transfer of the pronator quadratus motor branch for wrist extension reconstruction in brachial plexus palsy. Plast Reconstr Surg 2012;130:1269-78. Bertelli JA, Ghizoni MF. Transfer of supinator motor branches to the posterior interosseous nerve in C7-T1 brachial plexus palsy. J Neurosurg 2010;113:129-32. Dong Z, Gu YD, Zhang CG, Zhang L. Clinical use of supinator motor branch transfer to the posterior interosseous nerve in C7-T1 brachial plexus palsies. J Neurosurg 2010;113:113-7. Boutros S, Nath RK, Yüksel E, Weinfeld AB, Mackinnon SE. Transfer of flexor carpi ulnaris branch of the ulnar nerve to the pronator teres nerve: Histomorphometric analysis. J Reconstr Microsurg 1999;15:119-22. Tung TH, Mackinnon SE. Flexor digitorum superficialis nerve transfer to restore pronation: Two case reports and anatomic study. J Hand Surg Am 2001;26:1065-72. Zheng XY, Hou CL, Gu YD, Shi QL, Guan SB. Repair of brachial plexus lower trunk injury by transferring brachialis muscle branch of musculocutaneous nerve: Anatomic feasibility and clinical trials. Chin Med J (Engl) 2008;121:99-104. Hsiao EC, Fox IK, Tung TH, Mackinnon SE. Motor nerve transfers to restore extrinsic median nerve function: Case report. Hand (NY) 2009;4:92-7. 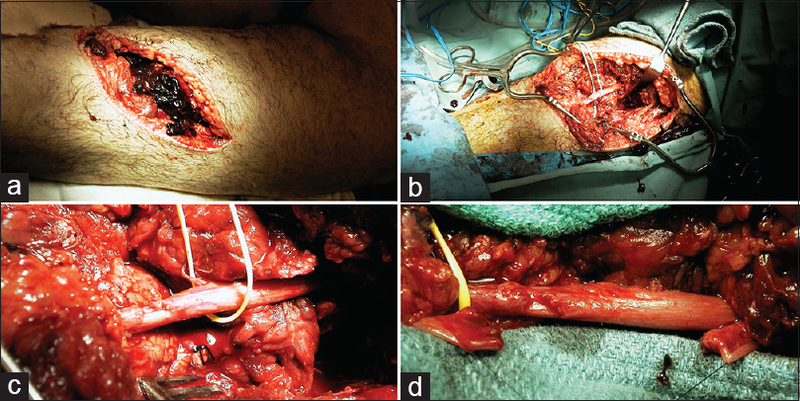 García-López A, Sebastian P, Martinez F, Perea D. Transfer of the nerve to the brachioradialis muscle to the anterior interosseous nerve for treatment for lower brachial plexus lesions: Case report. J Hand Surg Am 2011;36:394-7. 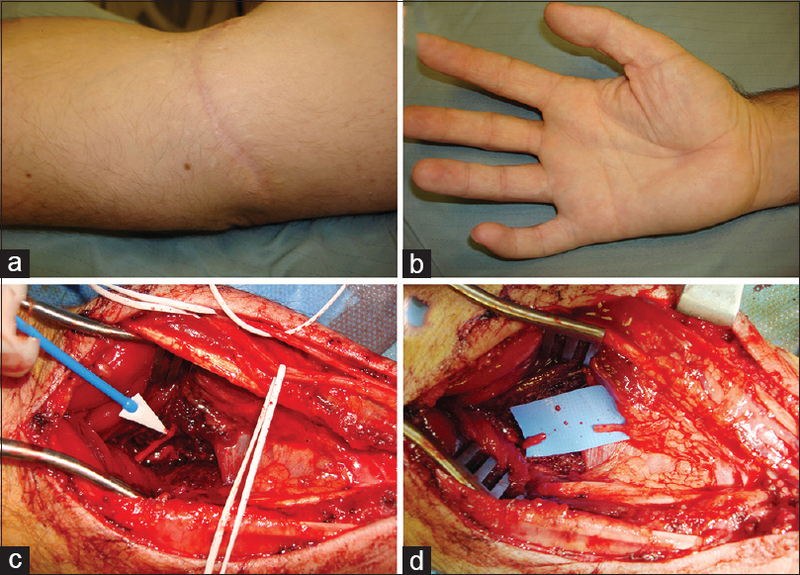 Battiston B, Lanzetta M. Reconstruction of high ulnar nerve lesions by distal double median to ulnar nerve transfer. J Hand Surg Am 1999;24:1185-91. Novak CB, Mackinnon SE. Distal anterior interosseous nerve transfer to the deep motor branch of the ulnar nerve for reconstruction of high ulnar nerve injuries. J Reconstr Microsurg 2002;18:459-64. Tung TH, Barbour JR, Gontre G, Daliwal G, Mackinnon SE. Transfer of the extensor digiti minimi and extensor carpi ulnaris branches of the posterior interosseous nerve to restore intrinsic hand function: Case report and anatomic study. J Hand Surg Am 2013;38:98-103. Nadi M, Ramachandran S, Islam A, Forden J, Guo GF, Midha R. Testing the effectiveness and the contribution of experimental supercharge (reversed) end-to-side nerve transfer. J Neurosurg 2018; 18:1-10. Farber SJ, Glaus SW, Moore AM, Hunter DA, Mackinnon SE, Johnson PJ. Supercharge nerve transfer to enhance motor recovery: A laboratory study. J Hand Surg Am 2013;38:466-77. Barbour J, Yee A, Kahn LC, Mackinnon SE. Supercharged end-to-side anterior interosseous to ulnar motor nerve transfer for intrinsic musculature reinnervation. J Hand Surg Am 2012;37:2150-9. Davidge KM MacKinnon S. The supercharge end-to-side anterior interosseous to ulnar motor nerve transfer for restoring intrinsic function: Clinical experience: Level 4 Evidence. J Hand Surg 2013;38:21-2. Kline DG KD, Midha R, Harsh C, Tiel R. Management and results of sciatic nerve injuries: A 24-year experience. J Neurosurg 1998;89:13-23. Moore AM KE, Parikh RP, Franco MJ, Tung TH. Femoral nerve transfers for restoring tibial nerve function: An anatomical study and clinical correlation: A report of 2 cases. J Neurosurg 2017;10:1-10. Berkowitz M Kruse D, O'Leary P, Harvey C. Spinal Cord Injury: An Analysis Of Medical And Social Costs. Berkowitz M, Kruse D, O'Leary P, Harvey C (editors). New York: Demos Medical Publishing; 1998. Fox IK DK, Novak CB, Hoben G, Kahn LC, Juknis N, Ruvinskaya R, Mackinnon SE. Use of peripheral nerve transfers in tetraplegia: Evaluation of feasibility and morbidity. Hand 2015;10:60-7. Bertelli JA GM. Nerve transfers for restoration of finger flexion in patients with tetraplegia. J Neurosurg: Spine 2017;26:55-61. Loch-Wilkinson T MS, White C, Schrag C, Midha R. Nerve Transfers in patients with Brown-Séquard Pattern of spinal cord injury: Report of 2 cases. World Neurosurg 2018;110:152-7.